A natural stone tile grout cleaner that will help you clean the toughest dirt and grime on all your natural stone, ceramic and porcelain tile and grout surfaces. We've been cleaning tile and grout for years and this is the first natural stone cleaner that's strong enough for us to use on ceramic and porcelain tile but safe for all our natural stone jobs. If you have any natural stone in your home or any tile for that matter, you know that the tile and of course the grout can get pretty dirty. This heavy duty stone, tile and grout cleaner is great for showers, floors, fireplaces, exterior patios and where you have natural stone and tile surfaces. MB-2 Heavy Duty Stone, Tile and Grout Cleaner is a highly concentrated product that is designed to clean the toughest soils from tile, grout all natural stones. Includes: MB-1 Neutral Floor Cleaner qt, MB-3 Soap Scum Remover qt, MB-5 Granite and Marble Spray Cleaner qt, MB-9 Mildew Remover qt, 1 grout brush, 1 squeegee and 32 oz. spray bottle. 1. Clean by sweeping or vacuuming floor first. 2. 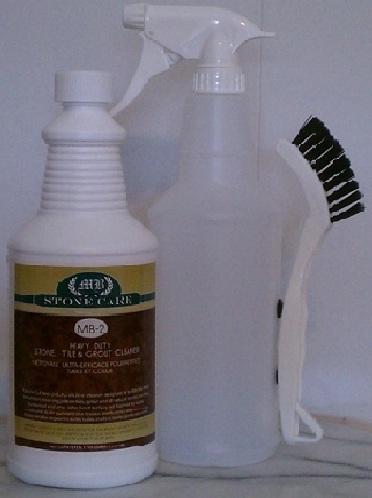 Dilute Heavy Duty Stone Tile Grout Cleaner with hot or warm water to strength needed. 3. 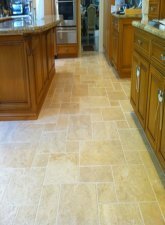 Apply diluted product to stone or tiled floor with a mop or sprayer. 4. Let solution sit on the floor, not allowing to dry anywhere from 5 to 10 minutes. The longer it sits the easier it is to scrub. 5. 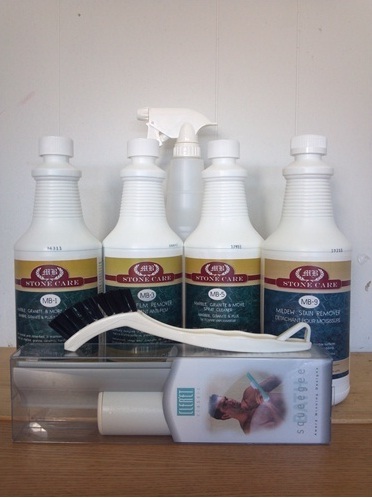 Scrub grout lines with a grout brush or deck brush. Next scrub tiles with soft bristled brush. 6. Mop up dirty solution or better yet, if you have a wet vac, vacuum up dirty solution. 7. Rinse with clean water the best you can, maybe even a few times. You can use a mop or a sparayer to help with rinsing. 8. Dry with cotton or microfiber cloths. 9. Seal the stone and grout with a penetrating sealer.